College of DuPage Foundation Alumni Relations is proud to announce the Distinguished Alumni Class of 2016. 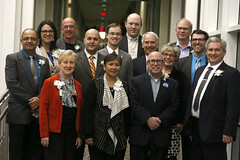 Please join us in congratulating the outstanding achievements of the following individuals. View pictures from the 2016 celebration event! Since age 5, Matthew Bonnan has been fascinated by dinosaurs and animal anatomy. This passion for science led Matthew to COD to pursue an A.S. in earth science, a bachelor’s degree in geological sciences at U of I Chicago, and a Ph.D. in biological sciences at Northern Illinois University. After earning his Ph.D. in 2001, he was appointed assistant professor of biological sciences at Western Illinois University and later promoted to associate professor. In 2012, Matthew joined the faculty at Stockton University in New Jersey as associate professor of biology. He has mentored nine master’s students and has overseen nearly 40 undergraduates in a variety of research projects. Matthew, as part of a team of scientists, discovered and published on three new sauropodomorph dinosaurs that document the transition from small bipeds to larger quadrupeds during the Early Jurassic period. He has published 20 peer-reviewed articles on dinosaurs, reptiles, mammals and sharks, and most recently authored The Bare Bones: An Unconventional Evolutionary History of the Skeleton. He maintains a website, The Evolving Paleontologist that highlights research and science education. View Matthew's acceptance speech from the celebration event. Jimmy Ray Elliott left a lucrative career in media to launch a nonprofit 501(C)(3) organization called Diveheart. His vision was to build confidence and independence in children, adults and veterans with disabilities through the sport of scuba diving. Jim was inspired to create Diveheart after teaching his blind daughter how to downhill ski. Jim has great hopes and aspirations for people with disabilities, works full-time at the organization as president and does not draw a salary. He has received awards for his selfless acts and has worked with people with disabilities throughout the world, including China, Australia, Israel and the U.K., also training thousands of volunteers how to dive with individuals with disabilities. Jim is a Rotary Club member and has been honored as the West Suburban Philanthropic Network Humanitarian of the Year and as a TED talks featured speaker. View Jimmy Ray's acceptance speech from the celebration event. Linda Feltman lives her life by always giving back. Over the years, she has been recognized for her work with small business and service to the community. In 1979, three years after completing her bachelor’s degree in advertising at Penn State, Linda was asked to be a principal in a manufacturing startup. That experience became the catalyst for nearly 40 years of involvement with small business and entrepreneurship. In 1982, Linda started her own small business, writing several books related to that, and selling her business in 2000, a year after she accepted a position at the Penn State SBDC. In 2005, Linda began teaching a class in entrepreneurship for the Penn State College of Communications, receiving the Deans Excellence Award for Outstanding Faculty Affiliate in 2009 and 2016. Linda helped Penn State grow its participation in Global Entrepreneurship Week, going from four events and 50 attendees to the No. 1 ranked U.S. partner. In 2015, she engaged more than 5,000 faculty, staff, students and community members to be a part of the largest GEW in the history of Penn State. View Linda's acceptance speech from the celebration event. Hashem Helmi came to COD to study computer science—but he returned to build an amazing career. Hashem is very well known and respected at COD, where he started as a lab supervisor in 1987 after earning his bachelor’s degree from the University of Illinois. While working at COD, he continued to take classes, received his second associate degree and earned his master’s degree from Elmhurst College in computer networking science. Hashem has served in the Classified Personnel Association, HAY Job Evaluation, Affirmative Action Committee and Community College Initiative Program. Hashem has been a social host to CCIP students, going above and beyond to make student experiences here great. He is also a point of contact on the multilingual employee list for many COD departments, helping students with the Persian/Farsi language. Outside COD, Hashem is an active community leader and volunteer. He taught Persian language classes, served as a host for exchange students through Share America and helped at Irshad Learning Center, a nonprofit organization for religious and cultural activities. View Hashem's acceptance speech from the celebration event. Janice Miller’s love for the nursing profession is clear. She earned her doctorate degree in adult education from Northern Illinois University as well as her BSN and MSN degrees from St. Xavier University. Her dissertation focused on the use of preceptors in acute care nursing, and she uses her research to facilitate the transition into professional practice for COD graduates. She worked as a maternal-child and hospice nurse, experiences and expertise that serve her students well in the classroom. She takes much pride and care in her work and is a wonderful role model for individuals around her. Janice has done a great deal philanthropically. As a young widow, she coordinated a support group for individuals who suffered the loss of a spouse. Janice has done mission work with Kenyan AIDS patients, assisted women needing help with their pregnancies and is an active leader in her church. Janice makes it her life mission to give back and is an inspiration to her students, colleagues and everyone she impacts with her services. View Janice's acceptance speech from the celebration event. Andrew has a remarkable track record of achievements. Earning his doctorate in physical chemistry from Northwestern University in 1983 and joining the 3M Corporation in 1999, Andrew led the team that developed 3M’s Multiplayer Optical Film (MOF) used in smart phones, computer displays and more. Andrew is one of the lead developers of the new Business Platform Architecture series taught to 3M technical employees and currently serves as a 3M advisor for Northwestern University’s Materials Research Science and Engineering Center Research Experience for Undergraduates program. He has served on the advisory board of the Singapore National Research Foundation and the University of Southern California Center for Global Innovation. In 2005, he was elected into the National Academy of Engineering. In 2013, Andrew received the R&D Magazine Innovator of the Year Award. He has more than 95 U.S. patents and more than 35 publications and presentations. View Andrew's acceptance speech from the celebration event. Laz Perez is known as a pillar of the community after serving 25 years in law enforcement and returning to COD in 2014 to teach police officers of tomorrow how to be successful officers. After Laz attended COD as a student, he went on to graduate from the Northwestern School of Police Staff and Command. Laz served as the program manager for the SLEA Basic Police Academy at COD until October 2016 and now serves as Deputy Chief in North Chicago. Prior to joining SLEA in 2014, Laz retired as chief of police of the West Chicago Police Department. Throughout his law enforcement career, he has served on several not-for-profit boards throughout DuPage County. He is a founding member of the DuPage Major Crimes Task Force, serving as an investigator, team leader, investigation commander and assistant task force commander. He uses his experience to guide and mentor police recruits as they begin their careers to protect and serve others. View Laz's acceptance speech from the celebration event. Mark Pfefferman embodies success in business and the community. He has led a progressively responsible career at TransUnion LLC through its exponential growth, being promoted 12 times in 24-plus years. From his current role leading TU’s sales content and management strategy to past roles in customer experience, change management, financial services, business intelligence, national accounts and many more organizational facets, Mark has always been counted on to drive TransUnion’s sellers and their support teams with clear goals and communications. Prior to TransUnion, Mark worked at Marshall Fields, where he advanced from running a small Bear’s Super Bowl boutique to managing a $20M store in six years. He is very active with civic activities, including leadership in the Village of Glen Ellyn, a former College of DuPage trustee, a current co-president of the Glenbard South High School Boosters with his wife Martha and board member for Anima/The Glen Ellyn Children’s Chorus and the Glen Ellyn Historical Society. Mark earned his Bachelor of Arts from University of Illinois and his Master of Business Administration from DePaul University. He remains a loyal COD supporter. View Mark's acceptance speech from the celebration event. Dr. Roy Karl Werner finds many ways to make a difference through medicine. Roy serves as medical director of the Department of Emergency Medicine and EMS medical director for Community First Medical Center in Chicago. A member of COD’s 1987 NJCAA National Championship Ice Hockey team, Roy is dedicated to ensuring a healthy community and safe sporting activities. He is an active volunteer in the sports community as both a medical professional and a coach. Roy provides volunteer concussion care and education to youth athletes and their families. He is developing an elite community rehabilitation clinic for mild traumatic brain injury, concussion care and recovery. He received his Bachelor of Science degree in molecular biology from Benedictine University, his Master of Science degree in molecular biology, microbiology and biochemistry from Southern Illinois University and his medical degree from the University of Illinois at Chicago School of Medicine. He helped to establish paramedical education in Saudi Arabia to improve pre-hospital care while he was at University of Iowa. View Roy's acceptance speech from the celebration event. Margaret Yancey is a positive force on a mission for change. One of a select few to receive the prestigious 2015 Presidential Management Fellowship, Margaret works for the Department of Energy in its Wind and Water Power Technologies Office. Her focus on public service and interest in social issues, especially environmental issues, have led to impressive career opportunities, including legislative assistant for a member of the Texas House of Representatives, legislative aide at McWilliams & Associates, the top grossing lobby firm in Texas, and water resources campaign coordinator for the National Wildlife Federation. Known for her positive spirit and leadership, the former COD Forensics Team competitor made such an impression on her coaches they created The Maggie Award, named in her honor to recognize others who best exemplify team leadership. Margaret holds a bachelor’s degree in journalism from the University of Texas and a master’s degree in public administration from the University of Nebraska. She serves on the COD Forensics Alumni Board and helped to create a mentoring program for speech team members. View Maggie's acceptance speech from the celebration event.